LATHAM, NEW YORK (November 13, 2018) – Leading Data Center and Cloud Hosting Solutions provider TurnKey Internet, Inc. announced today the expansion of the company’s Refer-A-Friend Loyalty Reward program combined with the launch of their 2018 Black Friday Deals offering some of the best cloud servers, dedicated servers, and web hosting offers for 2018. The expanded Refer-A-Friend program provides an incentive for our valued clients who already tell their friends and colleagues about the great service they receive every day with TurnKey Internet’s Cloud-Hosted services. An easy 1-click referral link is provided to clients that can be sent via email, social media, or placed on web sites, blogs or newsletters to automatically earn a $50 service credit. TurnKey Internet is expanding this Loyalty Reward program during the Black Friday season to $75 from the previous $50 – a 50% additional loyalty reward bonus during the 2018 holiday season. The company is launching this program at the start of the annual Holiday season to help increase the rewards for existing clients who participate. TurnKey Internet is known for running its eagerly-awaited, industry-leading deals and specials, and this year is no different. 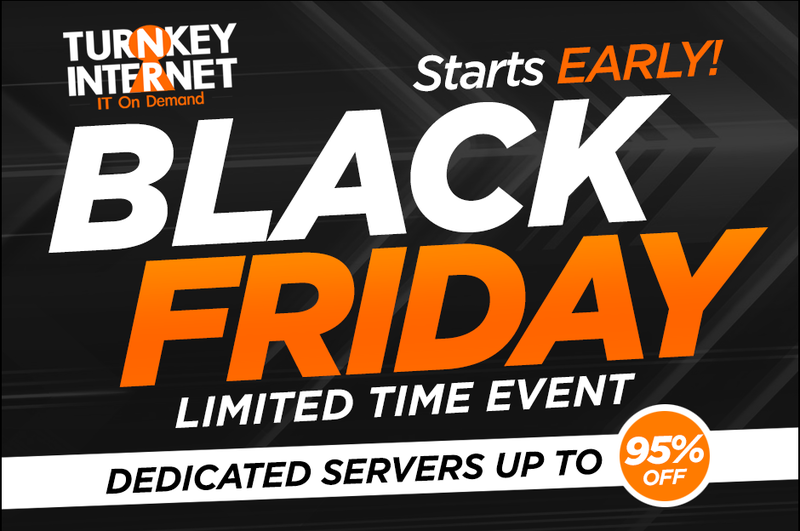 TurnKey Internet is offering up to 95% off for life on nearly every product they offer – cloud servers, disaster recovery backup services, cloud storage, dedicated servers, virtual private servers, cPanel web hosting, Microsoft Windows web hosting, enterprise colocation services, SEO optimized web hosting, and much more. More information can be found at https://turnkeyinternet.net/holiday/ . In a bold move in contrast to other companies that exclude or limit their best seasonal deals from existing clients – TurnKey is rewarding existing clients with an additional loyalty bonus. The loyalty bonus is applied as a free month of service for every previous year of loyalty when purchasing additional services during this Holiday promotional period. This gives existing clients access to deals greater than 95% off when factoring in the free loyalty bonus months of service included. Founded in 1999, TurnKey Internet, Inc. is a full-service Cloud Hosting Solutions provider with Data Centers in New York and California specializing in Infrastructure as a Service (IaaS) to clients in more than 150 countries. Services offered in both East Coast and West Coast, USA – include Public Cloud, Private Cloud, Dedicated & Bare Metal Servers, Backup & Disaster Recovery, Online Storage, Web Hosting, Managed Hosting, Hybrid Solutions and Enterprise Colocation. Headquartered in New York’s Tech Valley Region, TurnKey Internet’s Flagship company owned Datacenter is SSAE 18 SOC 1 & SOC 2 certified, as well as HIPAA compliant. The facility is powered exclusively by on-site Solar and Hydroelectric sources to provide a 100% renewable energy footprint and in 2013 was designated as the 39th ENERGY STAR® Certified Data Center in the United States. For more information, please call (518) 618-0999 or visit www.turnkeyinternet.net/media.